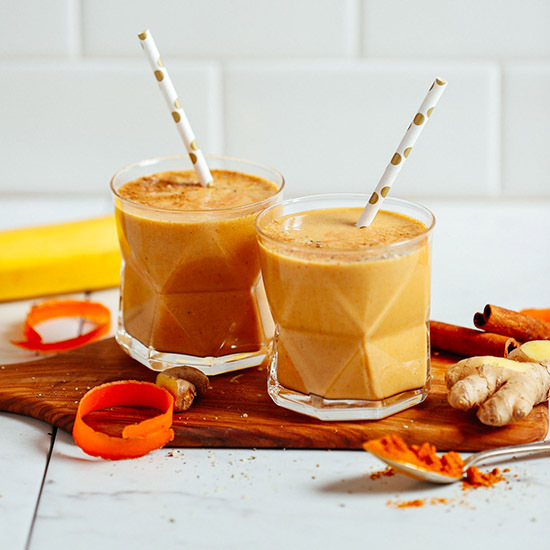 If you’re into golden milk, this smoothie is a must-try! It requires 7 wholesome ingredients (you likely have on hand right now), 1 blender, and 5 minutes to make. Let’s do this! The base of this smoothie is frozen banana for natural sweetness and a creamy texture. We tested other fruits and nothing quite worked. But if you’re trying (or prefer) to avoid banana, we include another option in the notes! For anti-inflammatory, antioxidant, and digestion benefits, we included plenty of fresh ginger and ground turmeric. Black pepper boosts the absorption of turmeric, so we added that as well. And don’t forget cinnamon for more natural sweetness and warmth. 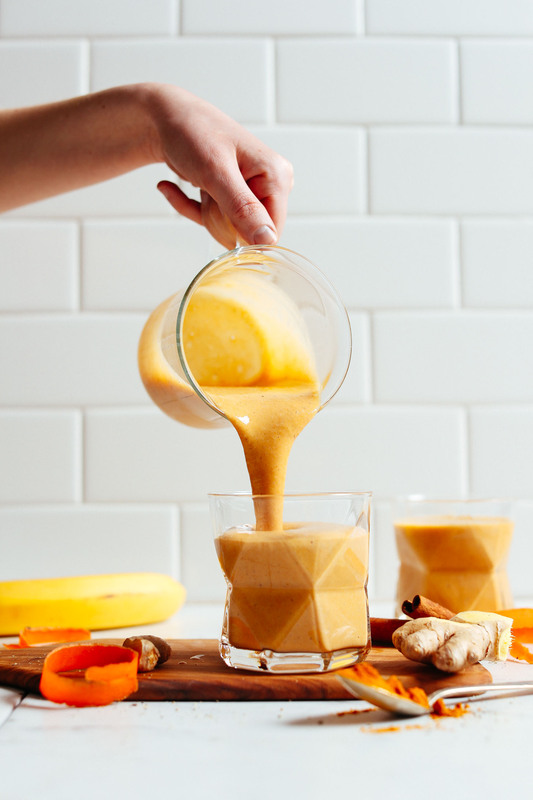 Coconut milk keeps things super creamy, and as an optional touch, we threw in some fresh carrot juice to balance the banana flavor and provide an even more intense orange (golden) hue. This would make the perfect quick breakfast or snack. For a little extra protein, add in some hemp seeds or protein powder of choice. And for the real deal, check out our 5-Minute Vegan Golden Milk! Want more healthy smoothie ideas? Check out our Carrot Ginger Turmeric Smoothie, Super Green Spirulina Smoothie, Almond Butter Blueberry Smoothie, and Creamy Zucchini Blueberry Smoothie. 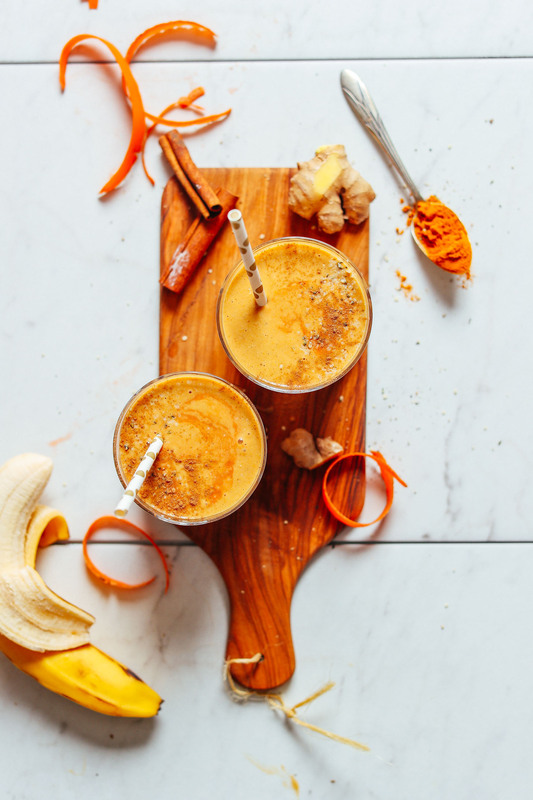 All of the delicious taste and health perks of golden milk in smoothie form! Just 7 ingredients, 1 blender, and 5 minutes required. Creamy, naturally sweet, subtly spiced, and packed with turmeric! 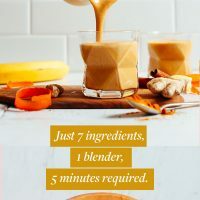 Add banana, coconut milk, turmeric, ginger, cinnamon, black pepper, and nutmeg to a high-speed blender and blend on high until creamy and smooth. If including, add cardamom, clove, and fresh carrot juice at this time (optional). If too thick, thin with more coconut milk or water. If too thin, thicken with ice (or more frozen banana, though it will add more sweetness). Taste and adjust flavor as needed, adding more cinnamon for warmth, black pepper for spice, ginger for "zing," turmeric for earthiness / more intense color, or banana for sweetness. Adding carrot juice will also add sweetness and more intense orange/yellow hue. Divide between serving glasses (ours are from West Elm) and enjoy immediately. Keep leftovers in the refrigerator for 24 hours. Freeze leftovers by pouring into an ice cube tray and use for future smoothies (either this smoothie or others you'd like to infuse with a golden milk flavor). 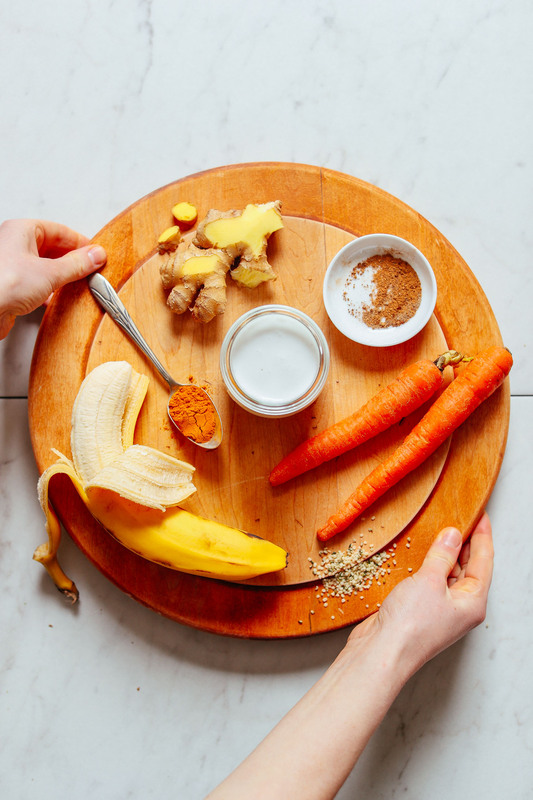 *If you're trying to avoid/sub banana, we'd recommend using the recommended amount of carrot juice, swap the banana for the same amount of cauliflower, and add some vanilla protein powder for sweetness. *Make carrot juice in a juicer, buy at the store, or add 1 raw or cooked carrot to the smoothie to a similar effect. *Nutrition information is a rough estimate based on full recipe calculated with light (canned) coconut milk and without optional ingredients. A beautiful blend of ingredients!! This was deliously refreshing!! I will be making and enjoying this smoothie often! Made this for breakfast this morning (it’s 5 degrees here, but YOLO) and it’s soooo yummy! I used 1/2 cup full-fat coconut milk and 1/2 cup almond milk (maybe a little more, as I wanted to finish the carton I had). I also used 1 heaping tsp of your 5 min golden milk mix, instead of dashes of the spices above, and first warmed/toasted on the stove with approx 2 tbsp coco milk to activate the magical powers of the turmeric & pepper. Used 1 small carrot vs. juice. Fabulous! This smoothie was tasty & creamy! Very easy to whip together in a Nutribullet & I cut up the amount of carrot listed into small pieces & blended it into the smoothie. I also used about a 1/2 teaspoon of ceylon cinnamon instead of a just a “dash,” – it was great. My boyfriend says it tastes like Christmas. Yummm! I made this one day straight from your recipe (using a fresh carrot) and it was delish! Today I modified it a little bit to make it more calorie dense so I could have it as a meal replacement and stay full. I added a spoonful of peanut butter, a spoonful of coconut cream, a few dates and some chia seeds and it was amazing. Will be making again very soon. Thoroughly enjoyed this recipe, and also other recipes to make coconut, almond, and oat milk. My upstairs 15 year old neighbor tried the milks, and although he is OPPOSED to anything that smacks of vegan “substitutes” is now enjoying his milks…..wants his mon to make granola now. Thanks so much for your blog; my sister reccomended it. Love your recipes. I thought I saw a recipe to make up a mixture of the dry ingredients for the golden milk somewhere on your site, so as to avoid mixing them up fresh every day. Was that you? When fall comes around and it becomes cooler, my appetite for smoothies usually declines. However, this one is a perfect smoothie for the fall! The combination of spices is excellent. I added a whole carrot in, and used plain soy milk, since that’s what I had on hand. So delicious and nutritious! Yes, that should work though you’ll want to just use a pinch as it is much more concentrated than fresh! I ended up substituting mango for the carrot and added a little water because it was very thick. For me, it tasted like a pumpkin spice latte minus the pumpkin. My kids (7 months, 3 &5) drank it up very quickly and were asking for more in no time! This will be a great thing to make after school or for quick breakfasts. I was never able to get into the “golden latte” thing (my sister loves them), but the ingredients here sounded tasty so I gave it a shot. I used 1/2 a ripe banana (wasn’t froze), half a cup of regular milk (hopefully that doesn’t offend anyone, it’s all I have right now) and skipped the carrot juice. Used all the spices and fresh ginger. I love this! It tastes like eggnog to me :) Will make again, and I’m going to share the recipe with my vegan sister for those times she might enjoy it chilled rather than hot. I love your site, by the way. I’ve made a few recipes for my sister (the vegan) and she’s loved every one of them, as have I.
Oh forgot to add, I put ice in it since my banana wasn’t frozen. Wish I could edit my comment. Glad to hear you enjoyed this recipe, Rachel! Hi Dana, where did you got those glasses? I LOVE this recipe and make it almost daily for me and my 3 year old. I make my own carrot juice first with 1 large carrot and 1 cup of water in the blender and then add the rest of the ingredients. So delicious!! Thank you for sharing this yummy recipe! Yay! We’re so glad you enjoyed it, Laura! So kind! We are glad you are loving the recipes, Dee! Perhaps this is obvious, but how do you ground your turmeric? I have always been able to find fresh turmeric root, similar to ginger root, and powdered turmeric which isn’t so fresh. The powdered turmeric in my pantry is not nearly the same vibrant orange color as yours pictured. Do you dry and grind the fresh turmeric root? Thanks can’t wait to try! Hi Susan! We use pre-ground turmeric! Writing this as I’m sipping on the smoothie! I happened to have all the ingredients in my kitchen and just love love love this! So happy I found a new variation to my smoothies! This is a keeper for sure! Love your recipes! I think yours is one of the best laid out websites I’ve come across! I love how you show pictures of the different stages. It’s so helpful while cooking especially if your new to this stuff! Thanks a ton!! Yay! We are glad you enjoyed it, Vidya! Soooooo good!!!! And because I love sugar :o I added 1/3 cup of dates. I want to eat this every morning. Whoop! Thanks for sharing, Kristel! 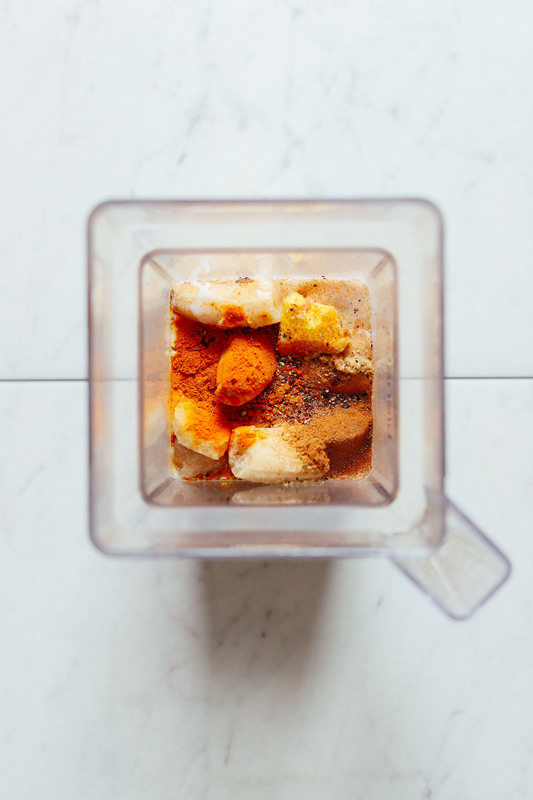 Thanks for this recipe… I was in a rut of always making my banana+almond milk+ almond butter smoothie…. and this was much different! 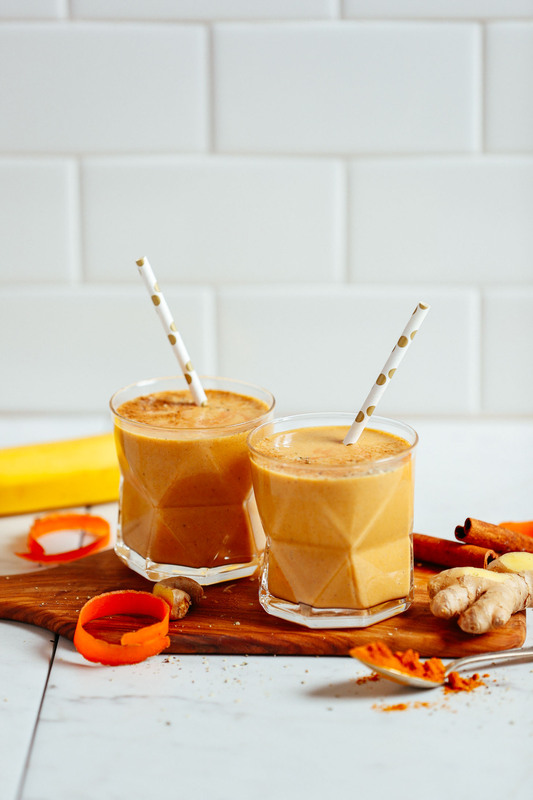 Tumeric lattes are showing up at a lot of coffee shops lately, so I was excited to try it in my smoothie! I just made this…and drank it…all. I used fresh turmeric, almond milk, and ground ginger as that’s what I had on hand. I didn’t feel like juicing a carrot so I threw a raw one in. Tasted great! Thanks for the recipe! Thanks for sharing! Love the whole carrot tip. Of course! Your blog and cookbooks are my go to’s when I am feeling less than inspired on my own. Amazing! I used almond milk instead of coconut milk and it turned out great! I also blended the hemp seeds into the smoothie instead of adding them on top. Really good recipe! Thanks! Great! Thanks for sharing your changes, Danielle! This was sooo good! I used a fresh banana and added ice. I also just used fresh raw carrots. It came out perfect. Yay! Glad to hear it, Carol! Just made it for my 85 year old mom and myself sitting in sunny Cleveland Ohio on a hot and sticky summer day. YUM!!!! I don’t think I’ve ever left a comment for you, but thanks for all of your recipes. So many of them have become my regular favorites! We are so glad to hear you and your Mom enjoyed this recipe, Wendy! Lovely! Thanks for the review. This is not related to the golden milk smoothie as I was unable to find a place on your site to reach you directly so here goes. I was wanting to make the roasted strawberry and cheesecake smoothie this morning but when I clicked on the link, it led me to the recipe for gingerly strawberry mango smoothie. Looks like there’s a problem with the link. Can you fix this so that I can make the strawberry cheesecake smoothie? Hi, Abby. Sorry for the confusion. I removed that recipe from the blog because it was an older recipe that didn’t get used very much, and also didn’t feel congruent with our brand anymore. Hopefully the other smoothies on the site provide a nice substitute! So good. I used almond milk instead of coconut milk and 1 small raw chopped carrot. I can’t wait to start my morning off with this tomorrow. Thanks for sharing your changes, Barb! Glad you enjoyed it! How do you prepare the ginger? Chopped or grated? Wow this smoothie is delicious! I just made it for the whole family and everyone loved it, including my 4 and 2 yrs old who begged me to make some more! I used full cream coconut milk, and a splash of almond milk as it was too thick. And a raw carrot – too lazy to juice it :) this is definitely a recipe to keep, thank you! I can’t wait to try this! I have fibromyalgia so I’ve been trying to eat turmeric. Do you think I could use fresh turmeric, rather than the powder? You can, but I prefer turmeric powder in this recipe. Let us know if you try fresh! I can’t wait to try this! If I have an allergy to carrots (yes, carrots. It’s strange, I know. ), What would you recommend as a substitute? Hmm, I’d recommend just leaving it out! Yum! I used whole carrots and added some protein powder. I love your recipes with turmeric! Whoop! Thanks for sharing, Sophie. another winner! so yummy! i love dana’s recipes and this one is a really welcomed switch up in my morning smoothie routine. the flavor profile is so comforting. i went ahead and used unsweetened vanilla cashew milk and put the carrots in whole (thank you, vitamix!). I made this morning and it was super good. Love your recipes! Absolutely delicious, Dana! I made this today for breakfast and I think I’ll be glowing all day! I added frozen mango for a little more color and sweetness. Thanks, as always, for the incredible inspiration! These were AMAZING – I made them for breakfast this morning and honestly had trouble sharing with the S/O. I also added mangoes, used full carrots instead of juice, and used a mixture of almond milk/coconut milk/coconut yogurt to the consistency/caloric intake I wanted. Also added chocolate protein powder. Soooooooo gooooood. This was absolutely delicious and so fresh! Loving your recipes, and especially that you add options for some ingredients (for ex. I didn’t have carrot juice but just grated a carrot instead and it was perfect) Thank you! Dana this was too good and completely satisfied my craving! The only thing I’d do differently next time is make a carrot + ginger juice first, since there were a few fibers that didn’t blend. I’ll also try and drink it a little slower because I already want another one! You cannot go wrong with the most simple smoothie recipes! I made nice cream with turmeric a few weeks ago and absolutely LOVED it. I definitely have to create that recipe again! Should the cauliflower be frozen? (Raw)? I’m assuming that already frozen cauliflower from the grocery store has been cooked so might not be appropriate. Either, but I would probably recommend steaming then freezing for best texture. Yum!!! I really like the coconut milk/carrot juice/banana flavor with the spices. I’m not a smoothie person but I will do this one again. I really would like to try this, but i always get concerned when I use turmeric because it almost always stains my dishes. Does anyone have suggestions to avoid this? Just wash your dishes right after in soapy hot water. I didn’t find that this smoothie stained the blender or glasses because the turmeric is not hot. Add some lemon or vinegar to the soapy water and let it sit for 10 minutes, then wash. Sparkly clean every time! How do I make fresh carrot juice? Do I need a juicer? Thank you. Can’t wait to try this. I love the original Golden Milk at night…this will be awesome for mornings. I sometimes will sub in avocado for the creaminess if I don’t want to use banana. Thanks for all these great ideas!! Dana, can avocado be added for creaminess as another option to banana? Yes, but avocado can have a flavor that’s hard to mask. I’d recommend trying a blend of cauliflower and avocado in place of banana. Then you’ll just need to compensate for lack of sweetness with protein powder OR stevia, etc. My husband said it reminded him of pumpkin pie! How much cauliflower instead of banana? The same amount (about 1 heaped cup). Just know it won’t be sweet so you may need a protein powder or stevia. Should the cauliflower be raw or cooked? Either or will work! If you have leftover steamed cauliflower, you can use that. Frozen works as well! How can have this milk warm. It’s winter where I am now and I’m used to having my milk a night before bedtime? This recipe is absolutely fantastically delicious! SO YUMMY and so good for you! Thank you very much for this recipe. I’ve tried it out a couple times and I love it and look forward to making this often. Thanks again! ? Yay! We are glad you enjoyed the golden milk smoothie, Janice! YUM! Definitely making one of these for dessert. Thanks, Dana! I am copying down your creamy vegan golden milk smoothie recipe and i am going to make your smoothie at the end of this month when i buy the rest of the ingredients.i have the spices and the ground turmeric but i don’t have the banana,carrots,coconut milk or almond milk or the stevia powder. The carbs and sugar are very high and i was wondering if i can use half a frozen banana instead of a large whole frozen banana in your smoothie.Can i use an avocado and liquid stevia in your smoothie? I am a type 2 diabetic so i have to watch my carbohydrates and sugar intake.how can i lower the carbs and sugars in your smoothie? This is a very good and healthy smoothie and hopefully it will help me to get some relief from my arthritis symptoms as i have daily chronic pain and inflammation and i take tylenol 3s or the tylenol extra strength and i use arthritis gel or creams on my joints which helps a bit to take away my symptoms but it isn’t a 100% pain free for me when i take these meds. Kim, I think halving the banana and adding whole carrots instead of juice would be a great place to start. you could also sub the majority of the fruit with either avocado or frozen coconut milk ice cubes and sweeten with stevia! I got hooked on golden milk from your original recipe that I have since adapted for daily consumption (sub the canned coconut milk and oil for almond milk and a dash of coconut vanilla creamer). Kim, I had arthritis pain in my hands and since I started drinking this every day it is GONE! Really Liz?! I am afraid that I have the early symptoms of rheumatoid arthritis and so have drastically altered my diet. I’ll add this to my regimen if it will help. Certainly looks anti-inflammatory. But is it this smoothie or the golden milk recipe that you drink everyday? Thank you Dana for this recipe and all your other excellent smoothie recipes and tips!! Your hard work and creativity is so helpful and appreciated.? Kim, I commented on this very topic and recommended substituting the carrots and bananas with avocado if you’re watching carbs, which should give you creaminess. I also have RA and fibromyalgia along with Type 2. Therefore, I try to avoid sugar as much as possible by using Stevia instead and also use a greens powder (for micronutrients) in my smoothies with cream of tarter (for potassium). Inflammation is rampant in society now. Avoiding all triggers is paramount. I feel far better with a diet change and have stopped my expensive RA and BP meds after incorporating turmeric/pepper/ginger and reducing sugars and carbs. It didn’t happen overnight, but it did. I also healed my leaky gut which was caused by Tylenol, stress, aspirin, etc. by eating organic bone broth that I season to taste. Your math is WAY OFF! This smoothie is 158 calories not counting the ginger or spices. Jason, thanks for the feedback. We just recalculated the recipe and it is correct when calculated using light coconut milk (as opposed to boxed, which is lower in fat). If you’re looking to reduce fat or calories, you can easily sub almond milk or even water. Peek, cooking does increase absorption, but it’s not necessary. If you’d like, you could always mix the turmeric in some boiling or hot water before adding it to the smoothie. Hope that helps! I actually keep a paste of turmeric, black pepper, and what i think of as “chai spices” like ginger, cinnamon, cardamom, and cloves in my fridge. I cook the turmeric with water and then add a little coconut oil and the spices, stir it until it’s a paste, and then put it in a jar. It makes adding it to smoothies easy with additional the benefit of being cooked to activate it. I’ve also read that black pepper increases the absorption of the turmeric. My four year old and I just devoured this! He gave it two thumbs up! I simply grated a few baby carrots into the blender since we didn’t have carrot juice. So creamy and delicious. Thank you!! Turmeric is anti-inflammatory, but the 17g of sugar FUEL inflammation and cancer. Sweetness can come from stevia if the banana and carrot is avoided. Use avocado for some creaminess. Feel free to adjust the smoothie for your needs, Laurie! Is there a substitute for carrot juice? I’d like to balance the banana but don’t have access to carrot juice or a juicer! So apparently some people have already had success adding fresh or cooked carrot to the smoothie! Can’t wait to try this. We were just discussing the other day how to add more turmeric to our diet. Question: why would anyone be avoiding bananas (other than simply not liking them)? Is there some problem with them, like the arsenic-in-rice thing? Some people just don’t like them, while others are trying to avoid starchier / sweeter fruits. We like to provide options! Or they are sensitive to bananas!! I have a friend who gets an upset stomach when she eats them! Bananas can cause constipation and my three-year old has issues with that. But eating plant based and healthy is hard without bananas! And he loves them, but I’m so thankful for the option! Do you try them when the skin has brown spots it’s less starchy then. The brown speckles mean the banana is ripe which is why it is easier to digest (and also doesn’t have that weird aftertaste). Never really understood why people insist on eating unripe (yellow but no speckles) bananas. Some people avoid bananas because of the sustainability aspect. Bananas are not local for most folks so they don’t buy them. From an ayurvedic perspective, fruits and vegetables don’t combine well so that would be one reason to avoid. Ripe bananas are laxative, green are constipating. Hi Marko! I can’t do bananas because of a histamine intolerance — bananas are very high histamine & cause me to react. Others can’t because of the carb content! I know it seems bizarre to not be able to eat something that seems so healthy! I sure do miss them! Thanks! We’ve been hard at work on that!